The Outdoor Antenna captures the cellular signal from the outside of your building and sends it into the Cellular Booster. 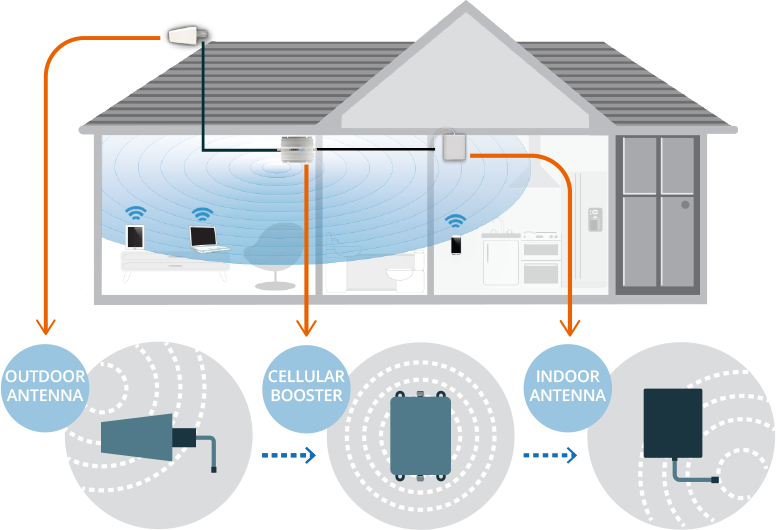 The Uniden® Cellular Booster amplifies your signal and sends it to your Indoor Antenna. The Indoor Antenna distributes your new strong signal in your troubled area, so you can enjoy crystal clear phone calls and lightning fast data speed. Uniden® Outdoor Antennas are used to capture the signal where you have it (ideally it will be outside your building where you have the most bars) and deliver it to your booster. You have 4 choices of outdoor antennas. The characteristics of each antenna is designed to conform to your location and needs. Very precise directional antenna with a powerful reach. Must be pointed towards your carrier’s cellular tower. Used best in rural areas when you are a long distance from a cellular tower. Very hign power and precise directional antenna with a powerful reach. Must be pointed towards your carrier’s cellular tower. Used best in rural areas when you are a very long distance from a cellular tower. The post is an omni-directional antenna. Will capture the signal from multiple carrier towers within a 360 degree reach. Used best in urban environments. Wide area directional antenna. Will capture the signal from multiple carrier towers within a 120 degree reach. Must be pointed towards your carrier’s cellular towers. Used best in urban or rural environments. The Uniden® Cellular Booster is the heart and soul of your system. There are a two main things to consider when selecting a booster. The first factor is the booster strength and the second is the networks (3G or 4G) that you want to boost. There are two factors to consider when deciding on your booster strength, the first is the size of the space you want coverage and the second is the strength of your outdoor signal. The larger the coverage area you need, you will need a more powerful booster. Pretty straightforward. The weaker the usable signal you have, you will need a more powerful booster, so if you have only 1 or 2 bars of signal outside your building where you are mounting your outdoor antenna, you will need a more powerful booster to cover the same area then say a less powerful booster with 4 or 5 bars outside. Uniden® Cellular Boosters come in a two flavors, You can get a booster for the 3G network or the 4G network. The 3G boosters will boost signal on all cellular carriers 3G networks in the United States and Canada. These boosters will boost your voice phone calls as well as your data at 3G speeds. Uniden® Indoor Antennas are used to distribute your amplified signal from the booster to your troubled area. You have 3 choices of indoor distribution antenna. The characteristics of each antenna is designed to conform to the shapeof your troubled area. The whip is an omni-directional antenna with a 360 degree reach. Designed to distribute the signal from the center of the troubled area. Typically it is connected directly to the booster. The dome is an omni-directional antenna with a 360 degree reach. Designed to distribute the signal from the center of the troubled area. Typically it is installed in a false or dropped ceiling. The panel is a directional antenna with a 120 degree reach Designed to distribute the signal from a perimeter wall or high ceiling. Uniden® Coaxial Cables are used to connect your signal booster to your outdoor and indoor antennas. All our cables are 50 ohm, so they are thicker and carry a signal better than your typical 75 ohm cable that is used for your TV. We offer pre cut and bulk sizes and we only use telecomunications grade connectors such as SMA or N Type. Typically used indoors and Very flexible. Low Loss Attenuation: • 5.7 dB loss per 100ft at 800MHz • 9.3 dB loss per 100ft at 1900MHz.